I’m so proud of our activists’ collective dedication, determination and subsequent victory in convincing the California Coastal Commission to flatly deny PG&E’s permit to move ahead on murderous ocean blasting off the California Central Coast. Here’s a selection of photos from both the Tidelands Park music fest and events surrounding yesterday’s California Coastal Commission hearing at the Santa Monica Civic. I’ll eventually get around to posting on the C.O.A.S.T. Alliance Facebook page, though that’ll have to wait a few days as I erred in having clicked on an offer supposedly enabling me to swap the regular blue Facebook theme to other colors. By doing so, an evil software extension glommed onto and disabled my Chrome browser, posted the same scam to every one of my Facebook friends’ walls (sorry, folks), and downloaded malicious software onto my hard drive. Because Facebook blocked me from posting anything for a few days, for the time being, please enjoy these pix in an email. Eric Greening testifies before commissioners and staff, California Coastal Commission hearing, Santa Monica. Just after the victorious California Coastal Commission hearing decision, Santa Monica. Happy faces after victorious California Coastal Commission hearing decision, Santa Monica. Grassroots activism at its best following California Coastal Commission denial of permit for PG&E to do seismic testing off our coast, Santa Monica. 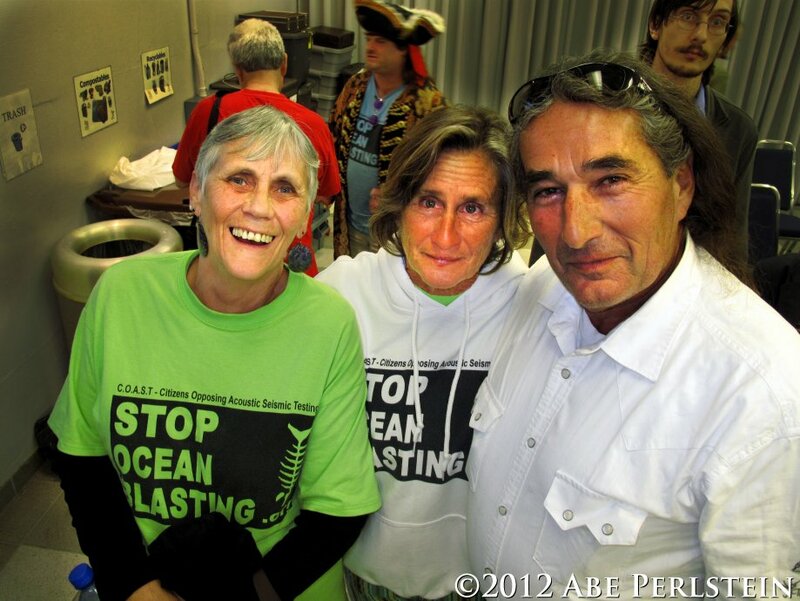 The celebratory mood following the California Coastal Commission’s denial of PG&E’s ocean blasting permit. C.O.A.S.T. Alliance spokeswomen, Molly Johnson and Mandy Davis, along with Northern Chumash Tribal Administrator, Fred Collins after the victorious California Coastal Commission hearing, Santa Monica. You guys rock!